Once again, members of the Selangor and Federal Territory Gardening Society have been invited to the Russells' private garden at Bukit Cheeding Estate. This was through the kind courtesy of Mrs. Joan Russell, and, I was told, was indeed the fourth time such an invitation had been extended. A group of thirty members in eleven cars met after the Batu Tiga toll plaza. The appointed time was 9.30 a.m. As for me, after having fetched Grace, I hastily proceeded to the Prince Hotel where Jade would be waiting. By the time everyone gathered it was already 10.00 a.m. All of us then eagerly proceeded towards Bukit Cheeding. We were all very excited about the trip. Grace even remarked that she would not miss this for anything. On the way, we discussed about exchanges of plants including the banana and serai wangi plants. On reaching the estate, we followed a helpful worker on a motorbike right up to the impressive residence, with its swimming pool and a nice pond full of water lilies. The whole place was on top of a hill, overlooking the tea plantation. As we looked round, there was indeed a great variety of plants and trees. This was a very pleasant experience for members like me, who had not been to Bukit Cheeding. It was a hot, but breezy morning, and the air was filled with the pleasant fragrance of frangipani and other flowers. The cheery songs of a vast variety of birds could also be heard. We were rewarded with a welcome drink, after which our hostess Joan, took us first around the colonial style bungalow with its photographs of Scotland, and then, of course her nice garden. She then sought the advice of gardening experts among us as to the best location for the newly acquired nutmeg and neem plants (both recently bought during the last Society trip to Penang). Arthur Chan, Society secretary and Philip Bauer, an agronomist with the tea plantation offered some suggestions. The nice garden was filled with rambutan, durian and frangipani trees as well as other flowering plants. Philip Bauer also told us the difference between highland and lowland tea plants. For lunch, we were lucky to be treated with a sumptuous buffet of roti canai, vadai and rice (Thai style) with herbs, accompanied by a variety of curries (chicken, mutton, prawns and fish). For desserts, we had pies, cheesecake, bread and sago puddings, ginger tea, ice cream and soursop sorbet. 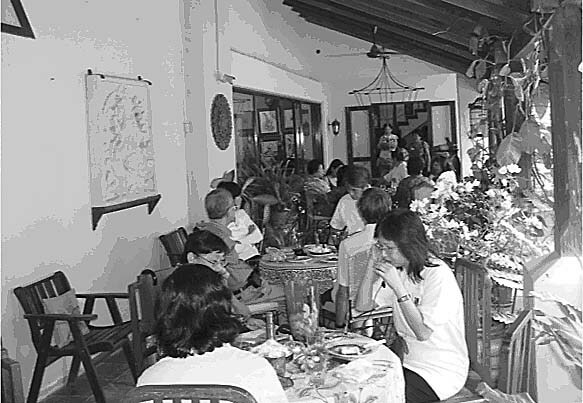 All the food was prepared by Joan's cook from Penang, who had been with her for more than ten years. 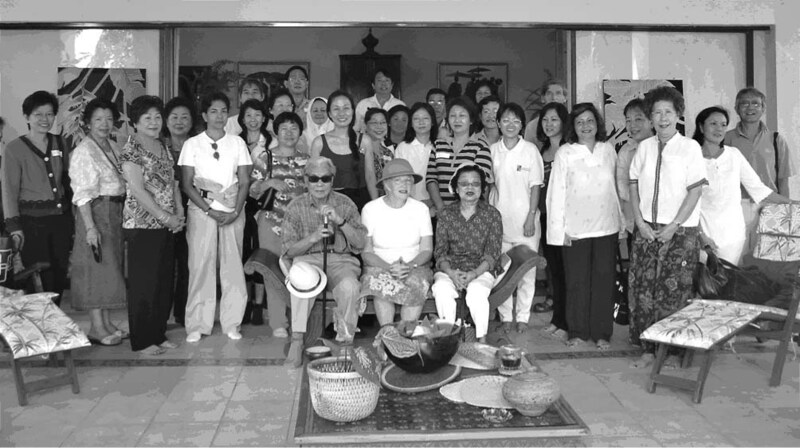 After lunch, the next Society's trip, this time to the Cameron Highlands and scheduled for 8-10 July 2005, was announced by Arthur Chan, who also, on behalf of the Society, thanked our gracious hostess for her warm hospitality. Members then recorded their personal appreciation in the guest book provided, before saying their grateful goodbyes to our wonderful hostess. I would like to see the contents of latest GREENFINGERS!